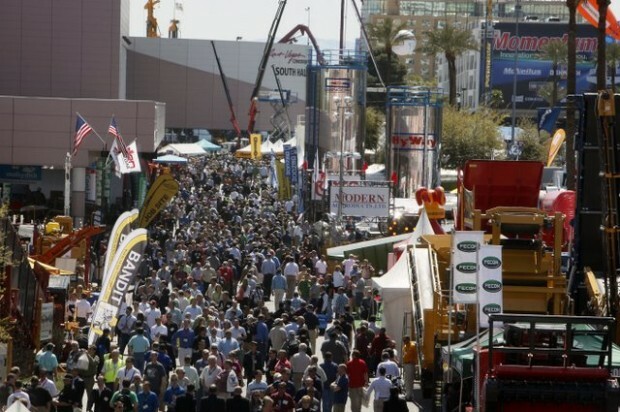 It only happens every three years and on March 4-8, at the Las Vegas Convention Center, CONEXPO-CON/AGG and IFPE will be the global industry gathering place for construction in 2014. An expected 2,000-plus exhibitors taking up 2.3 million net sq ft of exhibit space will showcase their latest innovations and technologies. They’ll be ready to discuss product features and applications to help attendees increase their productivity and profitability. Some 150,000 industry professionals from around the world are expected to attend the show and its many seminars and networking opportunities. CONEXPO education offers 120 sessions across 10 tracks to target the full range of attendee interests, including equipment management and maintenance, safety and regulations, recycling and preservation, earthmoving and site development and beyond. Safety and education/training will be spotlighted with focused industry events in the outdoor exhibit lots, in addition to the specialized product and country pavilions on the show floor. Attendees can efficiently plan their visit with the interactive online show planner, now available as a free mobile app, for added convenience and to stay connected during the shows, sponsored by Caterpillar Inc.
“Industry connections broaden our base to enhance the show experience for all — more interaction between qualified buyers and sellers, more industry education and more networking in a global environment,” stated CONEXPO-CON/AGG show director Megan Tanel. “More than ever, companies are looking at their bottom line and evaluating their investment of time and money. Industry collaborations are one way we offer real value in today’s marketplace for all participants,” added IFPE show director Melissa Magestro. Eight international exhibit pavilions will be featured for 2014: IFPE with China, Italy and Taiwan; CONEXPO-CON/AGG with China, Ireland, Korea, Spain and United Kingdom. Several national industry associations are holding their annual conventions or high-level board meetings at the shows; they join the hundreds of other industry and company meetings, from large events to smaller committees and other groups, all taking advantage of the shows to meet and share knowledge and learn from one another. Of course the many outdoor and indoor exhibit halls will be full of equipment, services, technologies and international associations peddling their newest products to the public. For more information on exhibiting or attending, go online to www.conexpoconagg.com or www.ifpe.com. Keith Gribbins is editor of Compact Equipment, based in Brecksville, Ohio. Caterpillar is rolling out four new D Series skid steer loaders and updating two current D Series machines to create the new D Series line featuring a completely redesigned cab with first-in-class features, new lift arm design for improved sight lines and increased engine performance. The four newest D Series models are replacements for their B3, C and C2 Series predecessors. The Cat D Series line now encompasses six skid steer loader models ranging in rated operating capacity from 1,800 to 3,700 lbs. The 236D and 242D are mid-size frame models and can be as narrow as 60 in. The largest D Series models, the 272D and 272D XHP, were launched in early 2012 and continue to be powered by electronically controlled 3.8-liter engines. For more info, visit www.cat.com. CASE Construction Equipment introduces the new Tier 4 Final TR270 Alpha Series compact track loader, an updated 74-hp model that increases bucket breakout force (7,270 lbs), torque (232 ft-lbs) and hydraulic flow (standard is 24.2 gpm and high flow is 32.4 gpm) compared to the previous model. The TR270 features a cooled exhaust gas recirculation (CEGR) engine with a particulate matter catalyst, which is made up of a diesel oxidation catalyst (DOC) and a high-efficiency, flow-through filter. This solution is efficient and maintenance free as it does not require manual regeneration or filter replacement. For more info, stop by booth 11722 or visit www.casece.com. Kubota offers a 92-hp compact track loader — the SVL90-2. The SVL90-2 is in compliance with the Tier 4 Interim exhaust emissions regulations, using a common rail fuel injection system, in combination with an EGR and a DPF system. Powered by an efficient Kubota engine, the compact track loader is all-Kubota designed, engineered and manufactured to deliver reliability, durability and quality. The SVL90-2 delivers best-in-class bucket breakout force and has exceptional lifting capacity, says Kubota. It has a bucket breakout force of 7,961 lbs and a lifting capacity of 5,869 lbs and a variety of performance-matched attachments are available. For more info, visit www.kubota.com. Featuring a four-cylinder, turbocharged Perkins 804C-33T diesel engine, the new 71-hp Terex PT-75 compact track loader is the newest member of the Terex line of Tier 4 Interim compliant compact construction equipment. Boasting a narrow machine width (70 in. ), the PT-75 track loader can easily maneuver and operate in confined or congested work sites, making it an ideal loader for landscapers and general contractors. Its purpose-built chassis is designed to be a heavy-duty machine within a compact package. Proving it has the power and productivity to get the job done, the PT-75 has 178.5 ft-lbs of peak torque, a tipping load of 6,200 lbs and a 3,100-lb operating capacity. For more info, visit www.terex.com/construction. JCB, one of the world’s leading telescopic handler producers, is unveiling a new compact model at CONEXPO 2014 to add to its growing Hi-Viz Loadall range for construction applications. The launch of the 525-60 brings a full-size telehandler performance and features to the compact sector. With a maximum lift height of 20 ft and a load capacity of 5,500 lbs, the 525-60 is just 5 ft, 10 in. wide and 6 ft, 3 in. tall, allowing access to multi-story parking and permitting operation in confined site conditions. The 525-60 Hi-Viz replaces the 524-50, 527-55 and the 520-50 rear-engined models, with a modern side-engine mount design. For more info, visit www.jcbamericas.com. KOBELCO Construction Machinery USA, a global leader in the manufacture of crawler excavators, will be introducing a new model, the SK55SRX, to the North American market during CONEXPO. The SK55SRX is a mini excavator that delivers full size performance and short radius agility from its compact footprint. This new machine comes in both cab and canopy models. The 11,050-lb SK55 is engineered to supply maximum digging power while maintaining a short tail swing. Its 37.4-hp, water-cooled Yanmar diesel engine is not only powerful, but also fuel efficient, delivering operational cost savings through its multiple modes. For more info, visit www.kobelco-usa.com. More and more operators are realizing the versatility, comfort and productivity of Hyundai Construction Equipment’s line of compact radius excavators. The R35Z-9 is a state-of-the art earthmoving machine that is ideal for tight, confined jobsites and designed for maximum performance. The 8,050-lb R35Z-9 is powered by a reliable 26.5-hp, Tier 4 certified Yanmar 3TNV88 engine. The machine has a dig depth of 10 ft, 4 in. and a bucket breakout force of 7,050 lbs. The R35Z-9 offers a tail-swing radius of just 2 ft, 10 in., allowing for efficient operation on sites where space is limited. A spacious and ergonomically designed cabin is provided for maximum comfort. For more info, call 877.509.2254 or visit www.hceamericas.com. The Ditch Witch SK750 mini skid steer features 70 attachment options for a wide range of utility, landscaping, plumbing and other underground construction tasks, increased ground clearance and a high-drive track system to help perform multiple jobs on the same jobsite in less time. The design allows users to easily convert track stances between narrow (36 in.) for tight entry access and wide (42 in.) for enhanced stability. The SK750 mini skid steer offers up to 800 lbs of lift capacity and an 81-in. lift height. Operator areas are 50 percent larger and feature ergonomic controls with an optional single-level joystick. For more info, visit www.ditchwitch.com. With an arsenal of easy-to-replace attachments and intuitive controls, the S800TX is ready to take on anything. Its 35-hp engine won’t back down from the job. Vermeer backs it up with a three-year or 3,000-hour limited warranty coverage on the mainframe and boom loader arms. Other features and benefits include: joystick controls that let the operator take command; dedicated spring-cushioned operator platform keeps the operator out of the mud and dirt; and the aforementioned easy-to-replace attachments, from trenchers to tillers. For more info, visit www.vermeer.com or e-mail salesinfo@vermeer.com. Doosan Portable Power is introducing the industry’s first Tier 4 Final air compressors in the form of its most widely used models — the P185 and C185. With 100 psi at 185 cfm, the P185 and C185 meet the needs of a variety of applications, from powering handheld air tools to sandblasting, sprinkler and irrigation line blow-out, cable laying and pipeline testing. After extensive testing and review, Doosan Portable Power selected a 49-hp Deutz D2.9 L4 electronic engine with DOC-only after-treatment to power the C185 and P185. With the new engine at the helm, the P185 and C185 deliver nine and seven hours’ runtime at 100 percent load respectively. For more info, visit www.doosanportablepower.com. Ideal for a variety of applications ranging from light-duty demolition work to heavy-duty quarry demolition projects, Chicago Pneumatic’s RX breakers boast low maintenance, high power and reliability. All breakers in the RX Series feature innovative hybrid gas/oil technology and fewer moving parts for a lower maintenance hydraulic breaker. Also incorporated in the RX line of rig mounted hydraulic breakers are noise and vibration dampening technology and a highly efficient internal control valve making the RX breakers some of the quietest and most powerful on the market today. For more info, visit www.cp.com. Established and family-owned since 1910, Danuser has manufactured drilling machines since 1943. They have been experts in post driver technology since 1951 — including the Danuser CB40 hammer concrete breaker. It delivers up to 82,000 lbs of impact force with each cycle; breaks up to 9-in. thick reinforced concrete; operates on any skid steer with 12-30 gpm without additional setup; has an anti-dry fire feature that prevents unnecessary firing and improves durability; and delivers less maintenance with its drop hammer design. For more info, visit www.danuser.com. The multi-tasking 4-in-1 Combination Bucket keeps your skid steer productive and profitable. Use one bucket for a wide variety of applications such as site cleanup, grading, scraping, grappling, dozing dirt, brush removal, material spreading and more. The high-strength steel clam shell bottom is designed to prevent bowing with heavy material and two large, guarded cylinders provide powerful clamping. Sizes range from 60 to 84 in. with standard, heavy-duty and heavy-duty with teeth models to choose from. Heavy-duty buckets feature reinforcement plates and a holding valve to keep the clam in locked position. For more info, visit www.ceattachments.com. Michelin Agriculture Tires will expand its current backhoe product offering this year. New sizes and products will allow Michelin to provide a full product portfolio to serve the North American backhoe market. The MICHELIN Power CL, scheduled for a July launch, is a premium bias ply tire that can handle the same load capacity as a radial tire, but with bias ply cost savings. The MICHELIN BibLoad Hard Surface (HS) radial tire, planned for a November launch, is the hard surface version of the MICHELIN XMCL all-terrain backhoe radial tire. For more info, stop by booth 10378 or visit www.michelinag.com. For OEMs wanting great power, torque and improved fuel economy, the single turbo Perkins 1204F-E44TA, designed to meet U.S. EPA Tier 4 Final, is a 4.4 liter, four-cylinder after-cooled engine capable of producing up to 147 hp. Perkins has minimized the impact of the after-treatment required to meet Tier 4 Final by integrating the diesel oxidation catalyst (DOC) and the selective catalytic reduction (SCR) system into one module, which can be mounted in a variety of remote locations, freeing up valuable space in the engine bay. For more info, see the 1204F-E44TA at Southwest Products booth 6043 in the Silver Lot or visit www.perkins.com. Minnich Mfg. has introduced and will be displaying at CONEXPO its wireless remote control technology to increase efficiency and safety for concrete dowel-pin drilling applications. Unique to Minnich products, the patent-pending wireless remote control technology improves conditions on the jobsite by allowing the drill operator to have an improved vantage point for more accurate operation. By removing the operator from the drilling unit, the wireless remote control allows workers to avoid harmful dust and debris. For more info, visit www.minnich-mfg.com. Griffin’s hydraulic submersible pumps are available in axial flow, material handling and trash-handling models. The pumps range from 4 to 24 in. and are designed for handling volumes of water up to 20,000 U.S. gpm and head conditions up to 140 ft. The impellers can handle solids up to 3 in. They are ideal in high suction lift applications such as sewer bypass jobs (where conventional above ground prime-assisted pumps cannot be used due to suction lift limitations), open pumping, sumping, dewatering of construction excavations and flood control. For more info, visit www.griffindewatering.com. Connecting the shop to your mobile mechanic is now easier than ever with Equipment360’s Mobile Mechanic App from HCSS. Your mechanic can now work offline in remote locations while still keeping track of work orders and time cards. He or she can easily create new work orders on the fly, add pictures and notes to work orders and see equipment warranty information, backlog and reference parts lists — all wrapped up in the convenience of a standard off-the-shelf iPad. Download a free demo version of the Mobile Mechanic at www.hcss.com or call 800.683.3196. The patented Stumpiranha from Leading Edge Attachments Inc. is a stump removal tool that replaces the slow process of stump grinding and allows for complete removal without leaving grindings or stump remains that can cause sinkholes later. Stump grinders are expensive, slow and tap into the hydraulics of a machine which can introduce contaminants in the excavator’s complex hydraulic system. The Stumpiranha attaches to an excavator or backhoe similar to a bucket, and allows the stump to be cut and ripped under the stump from the roots. For more info, visit www.stumpiranha.com. Paladin Attachments announced the new Bradco flail mowers for excavators — the newest additions to Paladin’s extensive ground-clearing selection of attachments. The new Bradco flail mowers are capable of clearing tall grasses, heavy brush and trees up to 4 to 6 in. in diameter from areas such as hillsides, roadways, ditches, utility right-of-ways, riverbanks and lake sides. Excavator mounting allows municipalities, utility companies, farmers, ranchers and contractors to easily reach over obstructions, into ditches and up hillsides. For more info, visit www.paladinattachments.com. ALLU Group Inc. introduces the new DL Screening Buckets designed specifically for use with compact base machines such as mini excavators, small wheel loaders, skid steers and backhoes. One bucket allows you to change screen sizes ranging from 5/8, 1.25 and 2 in. just by changing out the screen and hammers. The DL Screening Bucket is the perfect tool for landscapers and is engineered to screen, mix, aerate and load top soil, peat and compost. For more info, visit www.allu.net. Hobart Brothers Co. has added to its Hobart family of American Welding Society E6010 stick electrodes. The new Hobart 610 stick electrode offers excellent penetration and greater arc stability for better operator control and weld quality. It is designed for use in pipe welding applications, construction and shipbuilding, maintenance welding and general-purpose fabrication, and it can be used in all welding positions. Due to a precise manufacturing process, the Hobart 610 stick electrode features a concentric design, ensuring an even coating along its entire length and consistent arc performance — every time, from every pound of product. For more info, call 800.424.1543 or visit www.HobartBrothers.com. Honda Power Equipment and its operating unit, Honda Engines, will have a dynamic presence at CONEXPO. Honda Power Equipment manufactures and markets a complete range of outdoor power equipment products including general purpose engines, outboard marine engines, generators, lawn mowers, pumps, snowblowers, tillers and beyond. At this year’s venue, the Honda Power Equipment team looks forward to showcasing its all-new Super Quiet Series EU7000is portable generator at booth #3484. Replacing the EU6500is model, the new generator delivers more of what Honda generator customers have come to expect from Honda. For more info, visit powerequipment.honda.com. The new Tier 4 E42 excavator now includes a non-DPF (diesel particulate filter) engine solution. This medium-size M-Series machine provides operators with all of the same performance benefits of the previous Tier 4 Interim model. The Tier 4 Bobcat non-DPF solution was achieved by designing an ultra-low particulate combustion (ULPC) engine. The ULPC is accomplished through a specially designed engine combustion chamber that significantly reduces the amounts of particulate matter created during combustion. Therefore, Tier 4 emissions compliance can be achieved without using a DPF. For more info, visit www.bobcat.com. Pavijet fills, paves and finishes with asphalt, concrete, gravel, millings and sand via its central auger and heated, vibratory screed. Unlike other attachments, excellent first compaction is achieved — which relies on the weight of the skid steer, rather than contents of the hopper. Pavijet’s hydraulically-controlled fully retractable screed allows for superior navigation of obstacles. Self levelling gear is standard. Main controls are hung inside the skid steer. A wireless device controls Pavijet from anywhere nearby. Two models are available: the forward-driving MG7 with side extending screed and the reverse-driving MG6 center line paver. For more info, visit www.MiniPaver.com. Designed for use on compact excavators, backhoe loaders and skid steer loaders in the 5- to 10-metric-ton weight range, the new Micro CPA drilling attachment by Montabert enables contractors to more efficiently complete a variety of underground utility-related tasks in rough and long-reach applications. Equipped with an 8- or 10-ft-long steel feed, a high performance Montabert HC20 drifter and a tilted cylinder providing a wide range of drill rotation, the attachment’s standard base unit drills holes ranging between 26 and 51 mm in diameter and up to 2 m deep. For more info, visit www.montabert.com/en/micro-cpa.html.